So this book isn’t entirely realistic. Too many coincidences. But what it is is SUPER cute. Natasha and Daniel meet. Then meet again. And again. Could it be fate pushing them together? Natasha doesn’t want to think so; after all, she trusts science, not concepts that cannot be scientifically proven. Daniel is moonstruck over Natasha. Unlike her, he believes in fate and love at first sight. Now he just has to convince Natasha that they were meant for each other. It sounds so cheesy and clichéd, doesn’t it? Like it was written for hopeless romantics specifically, no? Well I’m not what you would call a *hopeless romantic*. I love romance and definitely have my OTPs – Malec & Lamen – but I’m not easily swept off my feet in that department. I have a weakness though. Cuteness. I can’t resist atmospherically cute scenes. I especially cannot resist two people wanting to express their love but being extremely shy about it. Oh, it was adorable, okay? It reminded me of the romance between Eleanor and Park. To my surprise, it didn’t even feel as if their relationship progressed too fast, despite this novel taking place in a single day. Obviously, the characters do not jump on one another the moment they meet. Fioouuu. Although I was familiar with most of the mentioned notions, such as Dark Matter, Quantum theory and the Three Sisters of Fate (fate), I found their presence in the story very relevant. I was surprised by the love experiment, however. I’m quite eager to try the staring-into-each-other’s-eyes-for-four-minutes exercise myself. … Did I forget to mention that Natasha and Daniel cannot be together? She’s being deported tonight due to her status as an undocumented citizen. Well, well. Read this book to find out what happens. 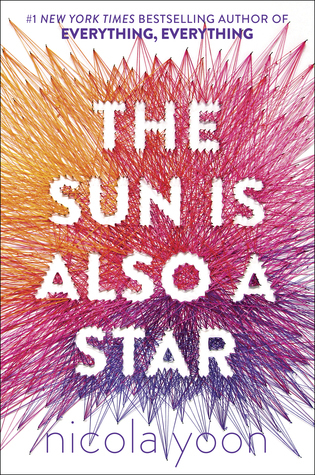 Sign into Goodreads to see if any of your friends have read The Sun Is Also a Star. Amazing review, Lola! I can't wait to read this!!! I've been wanting to read this one for a while now and knowing you enjoyed it, I'm pretty sure I will. This review is great by the way! Thanks so much xo I think you have to REALLY not be into romance stories to not enjoy this. Plus the whole subject of being undocumented is so important. Thanks for the review. I really liked Eleanor and Park and if this anywhere close I'm sure I will like it. I put it on my to read list. Your review is so cute too, Lola! Well she only wrote 2 books I recommend both. Ooh, I haven't read this yet, but it reminds me of a Japanese series called I'm Your Destiny. It's still ongoing though.